Hi guys, I am trying to change the size of my document. Originally, it was 30x30 cm, now I need 21x21 cm. My original document has about 50 master pages with multiple photo frames specifically placed and I need to rescale the master pages to fit my new, smaller size (no change in the size of margins or bleed). However, I have not found such option. 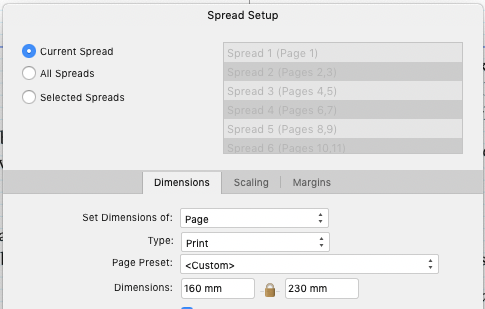 Whenever I change the dimensions in Spread Setup, the master pages stay the same., i.e. bigger than my new document pages and stay so when applied to pages. Is there any way to adjust/rescale the size of the master pages together with the change of the page size? Use the spreadpropertiesbutton on the tool bar for "all spreads" for the pages. Note this doesn't update the content,only the document size. This way, You are able to choose if You want to work with Curent/All/Selected spreads. Right click Spread properties doesn't allow this. I have experienced all pages content loss. Well, the closest I could get is image No 3. When I changed the dimension and applied to all spreads of master pages and set the scaling to Rescale. I will still have to adjust manually all my master pages to fit the new dimension+old margins and bleed and snapping. That is what I was trying to avoid. Maybe I am asking too much :-).